The devastating humanitarian and security consequences of the war in Syria have prompted renewed debate about U.S. policies to address the Syrian refugee crisis. Last week, more than 80 members of the House Republican caucus announced support for a ban on resettling refugees in the United States, regardless of their country of origin. The proposal echoes a call by Donald Trump, reiterated in the wake of the Orlando shooting, to restrict Muslim immigration. And 51 State Department officials filed a formal “dissent channel” memo advocating U.S. military action to bolster diplomatic efforts to resolve the Syrian civil war. Against this backdrop, Brookings convened a high-level forum of more than 100 policymakers, diplomats, activists, and scholars to identify possible solutions to the Syrian refugee crisis, with an emphasis on four key areas: Syria; front-line states; European cities; and the international refugee regime. The discussions offered new ideas for mitigating the Syrian refugee crisis that can help shape the agendas of the United Nations General Assembly’s plenary on refugees and migrants and President Obama’s summit on refugees (scheduled for September 19 and 20, respectively). Syria. The politics of rescue and the role of U.S. power to protect civilians and displaced persons have been hotly debated. As John McCain, David Miliband, Leon Wieseltier, and David Ignatius discussed at the forum, greater humanitarian assistance in besieged areas, deeper thought on the viability of safe-zones, and more extensive resettlement of refugees is needed. Front-line states. Lebanon, Jordan, and Turkey bear an enormous burden in managing refugee flows. Lebanon, a country with a population of 4.5 million people, hosts more Syrian refugees than the whole of Europe. Although front-line states have maintained an open-door policy, the scale of the crisis is fueling insecurity and polarization. Refugees have limited access to labor, education, and other public goods, and are often compelled to work in the grey economy, where they are vulnerable to exploitation. These problems are compounded by a myriad of legal, bureaucratic, and administrative challenges that make it difficult for international NGOs to provide humanitarian assistance on-the-ground. The international donor community needs to begin by marshaling more financial support for those states, including through innovative financing mechanisms such as the concessional loans being offered by the World Bank. Measures aimed at increasing the resilience of host communities should be a priority. For their part, front-line states—with support from the U.N. and relevant aid agencies—need to start taking steps, as Turkey has to a degree, towards providing refugees with work authorization and greater access to schools and health care. European cities. Among the most important institutions supporting the integration of refugees in Europe are those in cities. Local governments are responsible for providing housing, education, and jobs to new arrivals. Doing so effectively requires partnership with non-profit community organizations that have deep ties within neighborhoods—as well as the private sector, which has financial and other resources to bring to bear. For example, in Sweden, where the government offers a stipend to employers who hire refugees, LinkedIn has been using its platform to help new arrivals connect with jobs and internships. More of that type of cooperation is needed. Cities across Europe and the United States must share best practices, and federal governments must move quickly to allocate resources to the cities that are at the forefront of this crisis. International refugee regime. The modern international refugee regime was created in the aftermath of World War II, but the exceptional nature and consequences of the Syrian refugee crisis have brought into sharp relief a range of shortcomings. Less than 1 percent of the world’s refugees are resettled in developed countries. For this reason, the international community must identify ways to provide greater assistance for refugees in front-line states through increased and sustained development support aimed at improving the livelihoods of refugees and the resilience of host communities. While the scale, scope, and complexity of the global refugee crisis of 60 million displaced persons can be overwhelming, the crisis becomes more manageable when addressed on a regional basis and when the international community truly shares responsibility. As our colleague Leon Wieseltier has written, “We will never give help if we cannot picture need.” Countless journalists, scholars, and others have exposed and will continue to expose the nearly unimaginable level of Syrian refugees’ need, and the international community can work together to come up with more effective ways to give help. 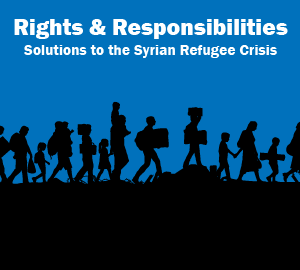 Keep an eye on our blog series, Rights and responsibilities: Solutions to the Syrian refugee crisis, as our colleagues at Brookings continue to lay out their ideas for improving the international response to the Syrian civil war and its tragic outcomes.